Karel Novak (Francis Lederer) has come to America from Czechoslovakia with $58 in his pocket and a mind full of big dreams. His excitement is palpable as he prepares to become an American citizen. But sadly, when he finally gets his chance to gain citizenship, Karel is turned away. Unbeknownst to him, the fee has been raised from $50 to $200, and there is no way for him to get more money. He’s faced with deportation and sent on a boat back to Europe, but makes a daring escape by jumping out of one of the boat’s portholes and into the harbor. He’s helped out of the water by a few helpful men on the shore, but in his haste to get away from them before they discover his identity, he loses his wallet. So there he is, in America but with no money for food or housing. He aimlessly wanders the streets and gets yelled by a cop each time he tries to stop and rest. Eventually he comes upon an alley with an open door, and just inside are tables full of food. He sneaks in and takes some of the food, only to be caught by showgirl Sylvia (Ginger Rogers). Luckily for Karel, Sylvia is the helpful type. She lets him eat to his fill and then offers to help him find a job, since her brother Frank (Jimmy Butler) is a paperboy. Karel and Sylvia become fast friends and help each other through a number of hurdles that arise, slowly falling for each other along the way. 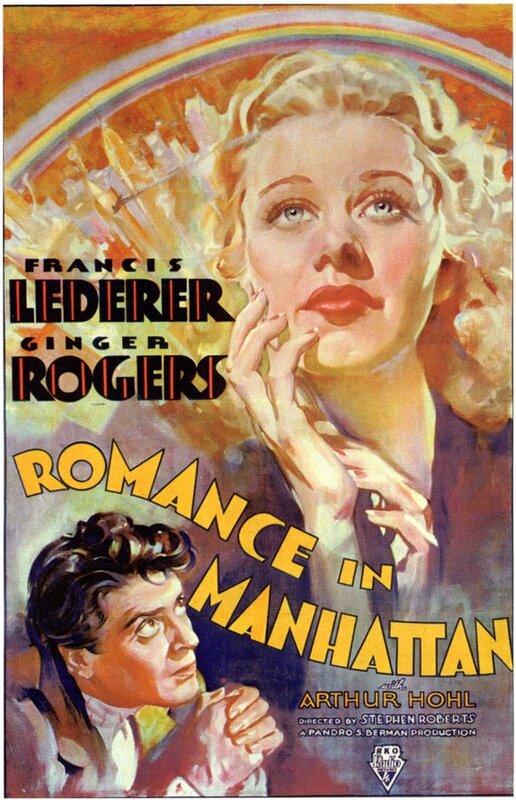 1935’s Romance in Manhattan is, just as you would guess from the title, a romantic drama/comedy. This RKO release was directed by Stephen Roberts (The Story of Temple Drake, The Ex-Mrs. Bradford) and is based on a story by Norman Krasna and Don Hartman. Romance in Manhattan instantly builds sympathy for Karel. Through Lederer’s performance the viewer can feel his excitement over the prospect of American citizenship, and it’s obvious that he’s worked very hard to get to America – saving up money, learning to speak English. It’s absolutely heartbreaking when he isn’t accepted due to the raised fee, and so even though he ends up entering the country illegally, the viewer still roots for Karel to make it in America. His character has such a sweet, childish optimism about the country that it’s hard not to love him from the get-go. 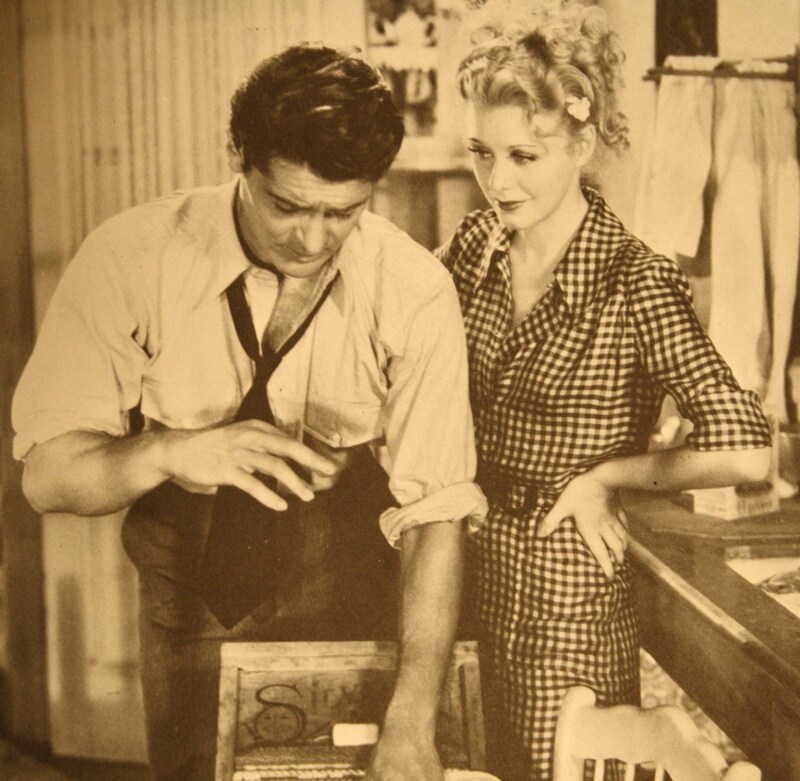 Rogers’ character of Sylvia is also instantly likable due to her willingness to help a total stranger. She’s kind, responsible and willing to do whatever she can for others, even though she doesn’t have much herself. The film spends a lot of time endearing the audience to its characters in the beginning, and it pays off in leaps and bounds. When things are looking up for them, the viewer is absolutely delighted, and when things take a turn for the worse, emotional impact is high. It can sometimes even be a bit difficult to watch, because the combination of effective performances and endearing, optimistic characters makes it that much harder for the viewer to accept the fact that big, big problems are inevitably going to arise for them. The ending, though a bit sudden, is (luckily) a triumphant one for Karel, Sylvia and Frank. Though the legal system may have worked against them on many occasions, they’re able to work out the major problems that they’re facing with the help of a couple of friendly cops, one of whom has become well acquainted with Karel and Sylvia and is more than willing to use his connections for their benefit. This ending is a relief for the viewer, who has spent the rest of the film worrying about how the lives of these characters could possibly end up happily.